As central economic planners at the Federal Reserve continue their vision of “prosperity” through crushing debt and dollar devaluation, some states are fighting back. 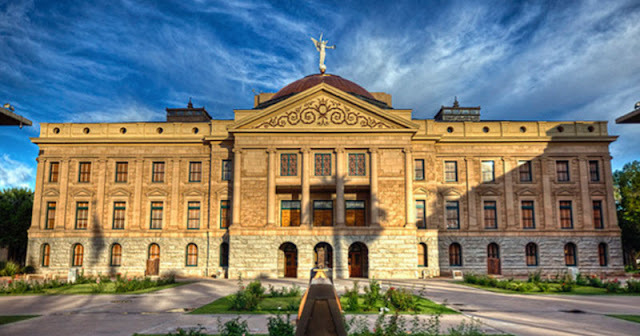 The Arizona House took a major step toward sound money by passing a bill to eliminate penalties in the form of taxes on gold and silver specie. The move would be an important step toward currency competition and help undermine the Fed’s monopoly on money. “Rep. Mark Finchem (R-Tucson) introduced House Bill 2014 (HB2014) on Jan. 9. The legislation would eliminate state capital gains taxes on income “derived from the exchange of one kind of legal tender for another kind of legal tender.” The bill defines legal tender as “a medium of exchange, including specie, that is authorized by the United States Constitution or Congress for the payment of debts, public charges, taxes and dues.” “Specie” means coins having precious metal content. “The U.S. Mint is charged with protecting the value of money, but the Federal Reserve creates nothing but debt. Yet Congress authorized a tax when making the exchange of precious metals for dollars. It’s illegal and they know it, this bill is an effort by one state to protect the people from such confiscation,” said Representative Finchem. The Arizona bill would allow people to “deduct the amount of any net capital gain derived from the exchange of one kind of legal tender for another kind of legal tender or specie (gold and silver coins) from their gross income on their state income tax.” The bill now moves to the Senate for consideration. Finchem argues that any perceived capital gain from gold and silver is not actually a gain, but a protection against losing money in the inflationary federal reserve system. “Finchem’s theory of economics and currency, however, is that people buy gold coins not to make money but to keep from losing it in what he says is a flawed federal reserve system where federal reserve notes — the bills we carry in our wallets — actually lose value. “Let’s say it takes 1,200 of them to buy a U.S. Mint gold coin today, but tomorrow it takes 1,300 of those federal reserve notes,” he explained. From Finchem’s perspective — and that of House members who gave his measure preliminary approval this past week — selling that coin for $100 more is not a profit. “You’ve actually experienced a loss,” he said. If more states can manage to remove punishments such as unjust taxation on gold and silver “gains,” currency competition could return, bringing us toward sound money and away from fiat currency that brings unchecked debt and contributes to financial disasters. Forces at the state and federal level will be working to kill the Arizona bill in order to preserve the Fed’s monopoly on money and the influx of unjust taxes into state coffers. Opponents of the bill are fear-mongering about money traders coming into Arizona and making “a lot of money” without giving their “fair share” in taxes to the state. In 2013, then-governor Jan Brewer vetoed a similar bill on such grounds. Other states have staked their position too. Utah and Oklahoma have declared gold and silver legal tender in their state, free from any taxation. Such moves are critical in dispensing with the idea that gold and silver are merely investments and speculation. Several other rules exist around the country that provide further disincentive for sound money through specie. As the Tenth Amendment Center points out, dealers who buy gold and silver from the public are required to collect personal information from sellers and upload this information daily into law enforcement databases. Some dealers are barred from selling gold and silver to anyone for seven days, forcing them to tie up large amounts of capital and absorb market risk. Such rules rig the system in favor of the Fed’s monopoly on money and create the perception that gold and silver are nothing more than commodity investments.